Table No. 54072V - 3 in 1 Bridge Table, Console & Dining Table - This innovative design enables you to convert the Console and Bridge Table with faux drawer into a full sized Dining Table simply by adding two leaves. Made of fine hardwood solids and veneers with traditional cherry finish. Table converts in two easy steps. Casino Bridge Table Covers are also available for your tables. 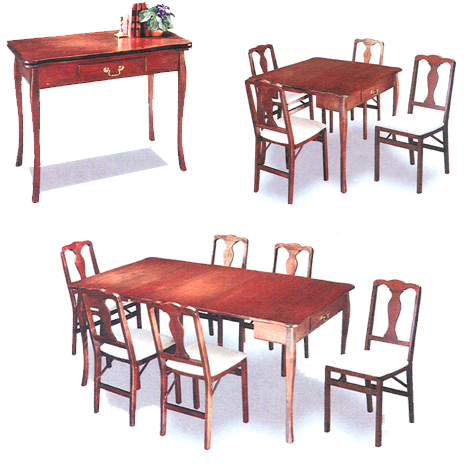 Additionally, we offer many Bridge Chair Styles all featuring a Cherry finish to match your table. Please feel free to browse our selection of Bridge Playing Cards and Bridge Supplies, or contact us for a Free 104 Page Casino/Game Room Catalog.